This individual Report The Market for Corporate Cards is available for purchase. This Report is available to members of Mercator Advisory Group’s Credit Advisory Service. Please be advised that this Report is normally part of a research and advisory service that provides ongoing support throughout the year. As such, this Report contains significant depth of content that is selected for its strategic importance to our members. (For a description of these services, see our Advisory Services section). As the consumer credit market matures, issuers and credit card associations are seeking new sources of transaction volume. Commercial card market is one of them. 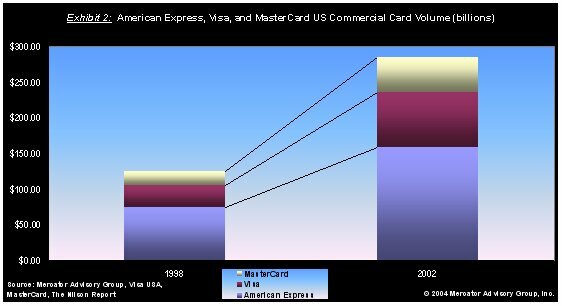 While the consumer credit card charge volume grew at 9.8 percent from 1998 to 2002, commercial card market grew at a 20-30 percent rate. During this period, the commercial card volume growth rates for American Express, and MasterCard/Visa combined were 20 percent and 25.77 percent respectively. Equipped with information management and e-business tools, commercial card programs offer corproations significant cost reductions in purchasing. And, as a result, their popularity is increasing. Evren Bayri, Director of Mercator Advisory Group's Credit Advisory Service and author of the report comments, "although there have been very significant developments in the way companies conduct business today, we have yet to realize the end-to-end e-business vision. Companies still print out invoices, handle purchasing manually and use cash and checks for payment, especially for large ticket items. Solutions such as Visa Commerce and MasterCard e-P3 are designed to tackle these hurdles and get companies closer to this streamlined vision of the future." This new Mercator Advisory Group report takes a closer look at this rapidly growing market, focusing on business cards, corporate cards and purchasing cards. It provides definitions, value propositions, market size, and example solutions for each category and highlights recent initiatives in the commercial card arena. Members of Mercator Advisory Group have access to this report as well as the upcoming research for the year ahead, presentations, analyst access and other membership benefits. Please visit us online at www.mercatoradvisorygroup.com.